May's SoxProspects.com Player and Pitcher of the Month are a pair of Greenville Drive teammates. Jantzen Witte and Jonathan Aro take home the hardware after a month of dominating the South Atlantic League. Jantzen Witte (pictured, left) beat up the South Atlantic League this month, hitting .389/.477/.648. Witte collected 42 hits in 108 at-bats in the month of May, spanning 30 games, including 15 doubles. Witte also added 18 walks, two triples and three home runs while collecting 27 RBI and scoring 24 runs himself. Witte finished May by going 3 for 4 in the final game of the month. A 24th-round selection in the 2013 draft currently leads the South Atlantic League in batting average, on-base percentage and slugging percentage as well as OPS. 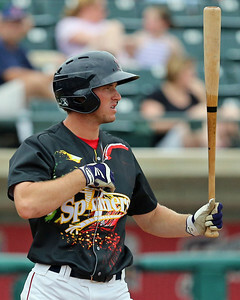 Witte was awarded Player of the Week honors for the week of May 5-11, 2014 and he currently clocks in at number 57 on the SoxProspects.com rankings. Travis Shaw merits special mention as the runner-up in the May Player of the Month race. Although Shaw was edged out, he still posted a gaudy line, hitting .331/.415/.648 through 32 games. Shaw did launch eight home runs in May, splitting time between Portland and Pawtucket, including his first Triple-A bomb on the month's final day. Jonathan Aro (pictured, right) dominated opposing hitters this month, striking out five times as many batters as he has walked (25 strikeouts to five walks). Aro allowed only eight hits and one earned run in 21 1/3 innings pitched, good for a nifty 0.64 ERA in May. He notched one win and two saves this month while appearing in six games as a piggyback starter for the Drive. Signed out of the Dominican Republic in 2011, the now-23-year-old has held opponents to a .114 batting average and a minuscule .349 OPS. 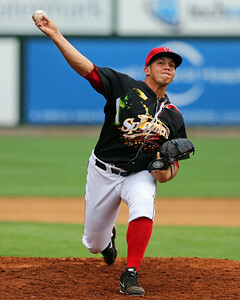 Aro took home SoxProspects.com All-Star honors as a Swingman/Piggback starter in 2013. Aro is currently ranked 58rd in the SoxProspects.com rankings.